Bill Raftery has watched dozens and dozens of Villanova basketball games since Jay Wright took over as head coach in 2001, watching the program rise to become one of the nation’s elite and being part of the CBS-TV call on the Wildcats’ national championships in 2016 and 2018. While the current team doesn’t have the firepower of last season’s champions, who lost their top four scorers to the NBA Draft, this year’s Cats have achieved much – a fifth Big East regular season title in the last six years and a conference tournament crown for the third straight year -- with a roster that includes seven freshmen and sophomores. “I think maybe this is his best coaching job,” said Raftery, the former La Salle player who is in his 37th season with CBS, during a break in last week’s Big East Tournament at Madison Square Garden. 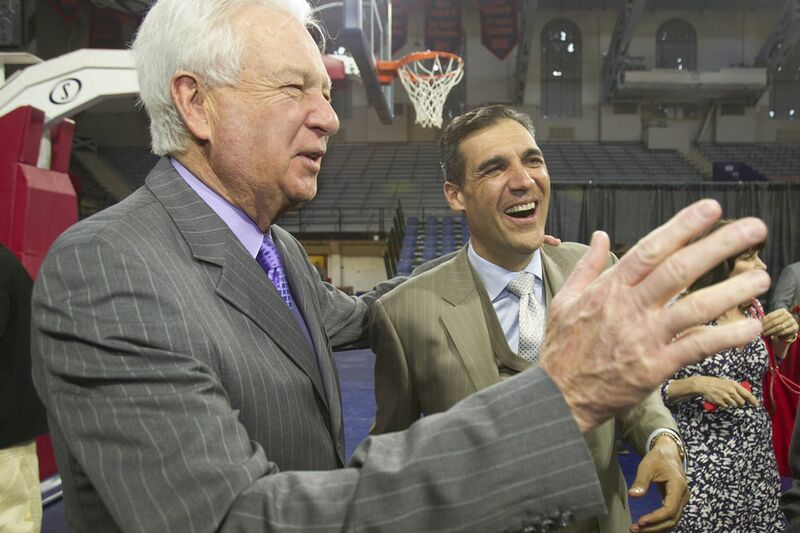 Raftery was one of three former collegiate head coaches-turned-television analysts interviewed by The Inquirer, along with Steve Lappas (Villanova, CBS and CBS Sports Network) and Steve Lavin (UCLA, St. John’s, Fox and Fox Sports 1). The Wildcats, who carry a 25-9 record and a No. 6 seed in the South Region into their opening NCAA Tournament game Thursday night against Saint Mary’s in Hartford, Conn., have gone through highs and lows this season with a team anchored by durable senior captains Phil Booth and Eric Paschall that also starts two sophomores and a freshman.. There was a 2-2 start that saw a crushing 27-point loss to Michigan in the 2018 national title rematch on the official opening night of the renovated Finneran Pavilion. There was an 11-game winning streak that included a 10-0 start in Big East competition. That was followed by a 3-5 mark that concluded the regular season, including three straight losses, all on the road, and left the Cats with plenty of questions heading into Madison Square Garden. Those questions were answered last week, ending with yet another trophy presentation. “Jay’s done as good a coaching job as ever with this group,” said Lappas, who also coached at Manhattan and Massachusetts and has spent the last 13 years in television. “What really hurt in this situation was that you don’t count on losing (Donte) DiVincenzo, you don’t count on losing (Omari) Spellman. Even if only one stays, having three weapons instead of two is a huge difference. Wright said near the end of the regular season that he felt he may have tinkered with the rotation a little too long, particularly during the losing streak. Lappas, who preceded Wright on the 'Nova bench, said it’s “tempting” to keep playing freshmen in the hopes they get better, but it doesn’t always work. The sophomores have come on. Lavin said it’s Wright’s flexibility, which he calls “one of his real strengths,” that allows players to grow, with forward Jermaine Samuels a case in point. Samuels, who sank 22 three-point baskets and shot 32.8 percent from deep in 31 regular-season games, went 7-of-18 (38.9 percent) in the three-game Big East Tournament. All three analysts will be working the first weekend of the NCAA Tournament – Raftery in Columbia, S.C., Lappas in Salt Lake City and Lavin in Tulsa, Okla. Being part of the main crew with Jim Nantz and Grant Hill, Raftery will be part of the team broadcasting the Final Four for the fifth straight year. He doesn’t know if he’ll see Villanova for a third time in four years, even though he said the Wildcats continue to have an “X” on their backs as defending champions.